There are sporadic periods of what appears to be radio frequency interference (e.g. between 1200 and 1330 UT, and at around 1700 and 1800 UT in the example above). The strength of these signals is approximately constant as a function of altitude and typically excedes that of the atmospheric signals at altitudes above 10 km. Since these signals can persist for the order of a few hours, they are accepted by the time-continuity (reliability) algorithm of version-1 signal processing. 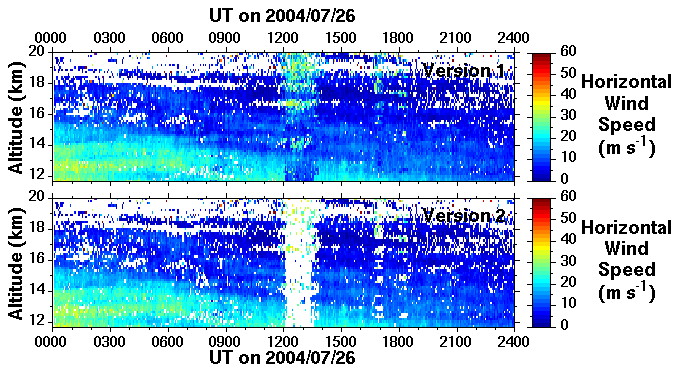 They give rise to narrow vertical bands of clearly anomolous wind data in the quick-look plots. The version-2 signal processing is effective at blanking these regions, but clearly leaves data gaps. This problem also affects version-0 products. Version-3 data products (which are due to be made available in early 2005) are sometimes affected, but as for the case of version-2 products, the result is data gaps rather than contaminated data.